Mouse tests confirm that sticky proteins associated with degenerative brain diseases can be transferred — but researchers say risks for humans are likely to be minimal. Neuroscientists have amassed more evidence for the hypothesis that sticky proteins that are a hallmark of neurodegenerative diseases can be transferred between people under particular conditions — and cause new damage in a recipient’s brain. They stress that their research does not suggest that disorders such as Alzheimer’s disease are contagious, but it does raise concern that certain medical and surgical procedures pose a risk of transmitting such proteins between humans, which might lead to brain disease decades later. “The risk may turn out to be minor — but it needs to be investigated urgently,” says John Collinge, a neurologist at University College London who led the research, which is published in Nature1 on 13 December. The work follows up on a provocative study published by Collinge’s team in 20152. The researchers discovered extensive deposits of a protein called amyloid-beta during post-mortem studies of the brains of four people in the United Kingdom. They had been treated for short stature during childhood with growth-hormone preparations derived from the pituitary glands of thousands of donors after death. The recipients had died in middle-age of a rare but deadly neurodegenerative condition called Creutzfeldt-Jakob disease (CJD), caused by the presence in some of the growth-hormone preparations of an infectious, misfolded protein — or prion — that causes CJD. But pathologists hadn’t expected to see the amyloid build up at such an early age. Collinge and his colleagues suggested that small amounts of amyloid-beta had also been transferred from the growth-hormone samples, and had caused, or ‘seeded’, the characteristic amyloid plaques. Reporter Ali Jennings delves into the research — and the backstory. Amyloid plaques in blood vessels in the brain are a hallmark of a disease called cerebral amyloid angiopathy (CAA) and they cause local bleeding. 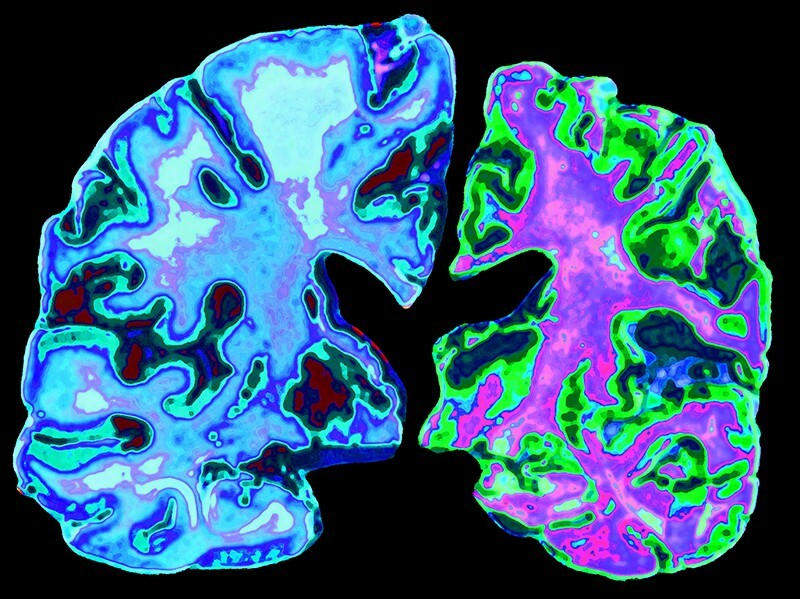 In Alzheimer’s disease, however, amyloid plaques are usually accompanied by another protein called tau — and the researchers worry that this might also be transmitted in the same way. But this was not the case in the brains of the four affected CJD patients, which instead had the hallmarks of CAA. 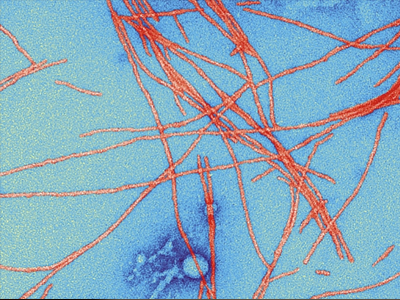 The team has now more directly tested the hypothesis that these proteins could be transmitted between humans through contaminated biological preparations. Britain stopped the cadaver-derived growth hormone treatment in 1985 and replaced it with a treatment that uses synthetic growth hormone. But Collinge’s team was able to locate old batches of the growth-hormone preparation stored as powder for decades at room temperature in laboratories at Porton Down, a national public-health research complex in southern England. When the researchers analysed the samples, their suspicions were confirmed: they found that some of the batches contained substantial levels of amyloid-beta and tau proteins. To test whether the amyloid-beta in these batches could cause the amyloid pathology, they injected samples directly into the brains of young mice genetically engineered to be susceptible to amyloid pathology. 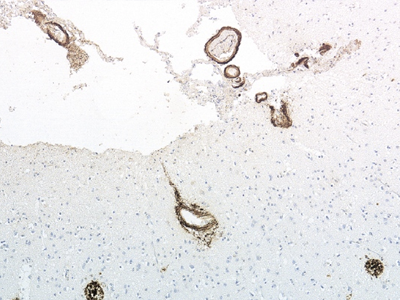 By mid-life, the mice had developed extensive amyloid plaques and CAA. Control mice that received either no treatment or treatment with synthetic growth hormone didn’t have amyloid build up. The scientists are now checking in separate mouse experiments whether the same is true for the tau protein. “It’s an important study, though the results are very expected,” says Mathias Jucker at the Hertie Institute for Clinical Brain Research in Tubingen, Germany. Jucker demonstrated in 2006 that amyloid-beta extracted from human brain could initiate CAA and plaques in the brains of mice3. Many other mouse studies have also since confirmed this. So far, epidemiologists have not been able to assess whether a history of surgery increases the risk of developing a neurodegenerative disease in later life — because medical databases tend not to include this type of data. But epidemiologist Roy Anderson at Imperial College London says researchers are taking the possibility seriously. Major population cohort studies, such as the US Framingham Heart Study, are starting to collect information about participants’ past surgical procedures, along with other medical data. Collinge says he applied unsuccessfully for a grant to develop decontamination techniques for surgical instruments after his 2015 paper came out. “We raised an important public-health question, and it is frustrating that it has not yet been addressed.” But he notes that an actual risk from neurosurgery has not yet been established. Clarification 14 December 2018: This story has been amended to make clear that the four CJD patients mentioned from the 2015 study had extensive build-up of amyloid-beta in their brains. Purro, S. A. et al. Nature https://doi.org/10.1038/s41586-018-0790-y (2018). Jaunmuktane, Z. et al. Nature 525, 247–250 (2015). Meyer-Luehmann, M. et al. Science 313, 1781-1784 (2006). Eisele, Y.S. et al. Proc. Natl Acad. Sci. USA 106, 12926–12931 (2009). Frontezek, K., Lutz, M. I., Aguzzi, A., Kovacs, G. G. & Budka, H. Swiss Med. Wkly 146, w14287 (2016). Hamaguchi, T. et al. Acta Neuropathol. 132, 313–315 (2016). Cali, I. et al. Acta Neuropath. Commun. 6, 5 (2018). Duyckaerts, C. et al. Acta Neuropath. 135, 201-212 (2018). Is ‘friendly fire’ in the brain provoking Alzheimer’s disease?